The Geldner Center is located at 908 N. Elm Street, Suite 314, in Hinsdale and 680 N. Lake Shore Drive, Suite 1325, in Chicago, 312- 981-4440, mygeldnercenter.com. From the time he was a child, Peter Geldner, M.D., knew he wanted to go into medicine. Born in Poland to a neurosurgeon and ophthalmologist who worked abroad, he grew up surrounded by doctors and people who practiced medicine. “The thought of treating people and treating disease made sense to me as a child,” he says. When he was first introduced to plastic surgery, he knew he had found his calling. Plastic surgery appealed to Dr. Geldner’s creative side, as well. Trust and interaction with patients is also extremely important, and something Dr. Geldner has worked hard to cultivate over the years. This involvement extends past surgery. 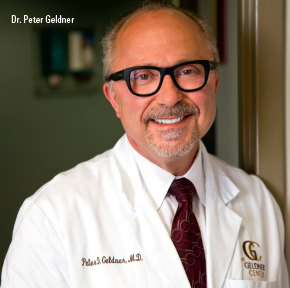 Dr. Geldner wants to focus on helping his patients in the long run, so he works with local aestheticians, nurses, and dieticians who can help patients continue to reap the benefits for many years to come. For example, if someone comes to The Geldner Center for a face lift, he helps them find a way to take better care of their skin, or if someone comes in for liposuction, he can refer them to a nutritionist to follow up with a healthier lifestyle plan. Dr. Geldner made his reputation with breast augmentation surgery, though as time goes on and his client base ages, his services increase as well. He now does a growing number of facial surgeries, though body work is still a large part of the practice. In this area, he is expanding the use of nonsurgical body contouring procedures, like CoolSculpting, which uses cold to break down fat cells and create contour changes. He also uses Ultherapy, where ultrasound waves focus on specific areas to create collagen formation and tighten skin. Dr. Geldner was certified by the American Board of Plastic Surgery in 1993, and has since become one of Chicago’s leading plastic surgeons. He serves as Assistant Clinical Professor in the Department of Surgery in the University of Illinois at Chicago, and Clinical Instructor at the University of Chicago, Department of Surgery, Section of Plastic Surgery. The Geldner Center has offices in Chicago and Hinsdale, Illinois. This story was sponsored by The Geldner Center. The center is located at 908 N. Elm Street, Suite 314, in Hinsdale and 680 N. Lake Shore Drive, Suite 1325, in Chicago, 312- 981-4440, mygeldnercenter.com.